Judy Batalion grew up in a house filled with endless piles of junk and layers of crumbs and dust; suffocated by tuna fish cans, old papers and magazines, swivel chairs, tea bags, clocks, cameras, printers, VHS tapes, ballpoint pens…obsessively gathered and stored by her hoarder mother. The first chance she had, she escaped the clutter to create a new identity—one made of order, regimen, and clean white walls. Until, one day, she found herself enmeshed in life's biggest chaos: motherhood. 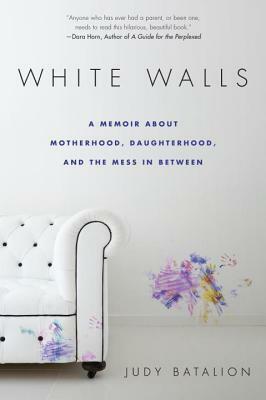 Told with heartbreaking honesty and humor, this is Judy's poignant account of her trials negotiating the messiness of motherhood and the indelible marks that mothers and daughters make on each other's lives. WOW! This Memoir was quite the emotional read. Just from the description alone you could feel how this entire family lived - as hoarders, ALL of them. This just left Judy Batalion wanting White Walls once she realized her entire family was hoarders. You just could not help but to feel sorry for her especially when she was a little girl, young and growing up inside of a Hoarder’s home because she didn’t know any better. This is how she and her family lived, this is what she was used to. We are all like that in a way. We are used to living the way we do and when we see things differently and start to learn that we may do things differently at our homes, that the way we live at home is completely different than the way other people live, our eyes have been opened and now we have to deal with a problem if we find one. We can’t just sit around and live with it, and decide what are we going to do because action needs to be taken. I was surprised how emotional of a read this book became. We could relate to how Judy felt through all the stages of her life, well into adulthood. We could relate to her having to confront her mother and try to get her to change, but we all know we can only change if we want to change. I think that was the hardest part for Judy. Read this one! It’s very well worth it! Enjoy!